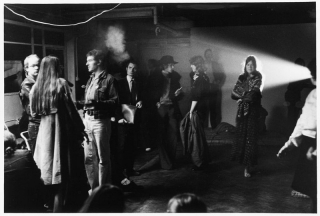 The London Film-Makers’ Co-operative was founded in 1966 and based upon the artist-led distribution centre created by Jonas Mekas and the New American Cinema Group. Both had a policy of open membership, accepting all submissions without judgement, but the LFMC was unique in incorporating the three key aspects of artist filmmaking: production, distribution and exhibition within a single facility. Early pioneers like Len Lye, Antony Balch, Margaret Tait and John Latham had already made remarkable personal films in Britain, but by the mid-60s interest in “underground” film was growing. On his arrival from New York, Stephen Dwoskin demonstrated and encouraged the possibilities of experimental filmmaking and the Co-op soon became a dynamic centre for the discussion, production and presentation of avant-garde film. Several key figures such as Peter Gidal, Malcolm Le Grice, John Smith and Chris Welsby went onto become internationally celebrated. Many others, like Annabel Nicolson and the fiercely autonomous and prolific Jeff Keen, worked across the boundaries between film and performance and remain relatively unknown, or at least unseen. The Co-op asserted the significance of the British films in line with international developments, whilst surviving hand-to-mouth in a series of run down buildings. The physical hardship of the organisation’s struggle contributed to the rigorous, formal nature of films produced during this period. While the Structural approach dominated, informing both the interior and landscape tendencies, the British filmmakers also made significant innovations with multi-screen films and expanded cinema events, producing works whose essence was defined by their ephemerality. Many of the works fell into the netherworld between film and fine art, never really seeming at home in either cinema or gallery spaces. Shoot Shoot Shoot, a major retrospective programme and research project, will bring these extraordinary works back to life. Curated by Mark Webber with assistance from Gregory Kurcewicz and Ben Cook. Shoot Shoot Shoot is a LUX project. Funded by the Arts Council of England National Touring Programme, the British Council, BFI and the Esmée Fairbairn Foundation.